We have begun to receive the first reports of aphid outbreaks in high tunnels on tomato, pepper, and cucumber (Figure 1). Aphids are a very common problem in high tunnels because the covering excludes rainfall, which is a major mortality factor for small insects like aphids. Some growers are interested in using biological control in their high tunnels because the ability to contain natural enemies within the tunnels increases the likelihood of achieving control. 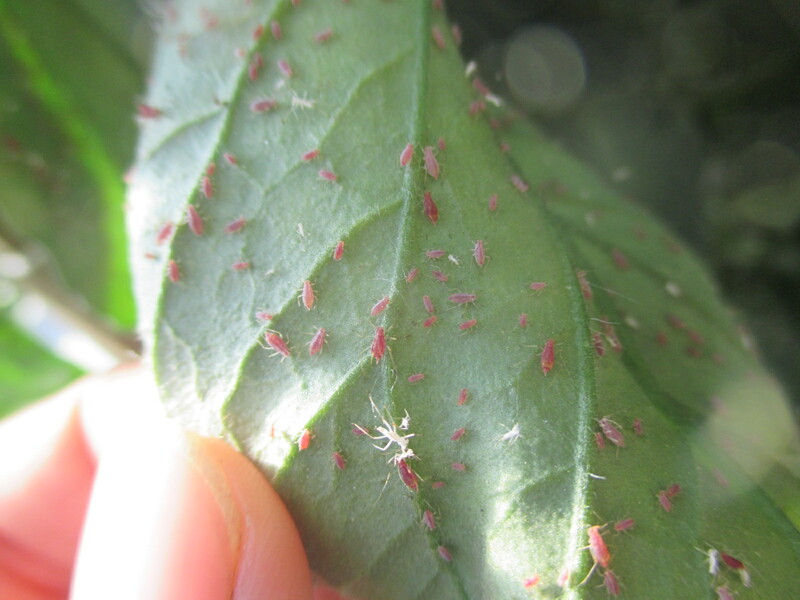 Based on our experience, we believe that lacewing larvae hold the greatest promise for successful biological control of aphids in high tunnels. Because they don’t fly, they are less likely to leave the high tunnel than many other biological control agents. There are a number of biological control suppliers who can provide lacewing larvae for growers. For growers interested in chemical control, some of the insecticides that could be expected to provide good control and are legal to use in high tunnels include Admire Pro®, Lannate®, Assail®, Belay®, Beleaf®, Exirel®, and Fulfill®. Be sure to confirm that the product you choose is labeled for your particular crop.